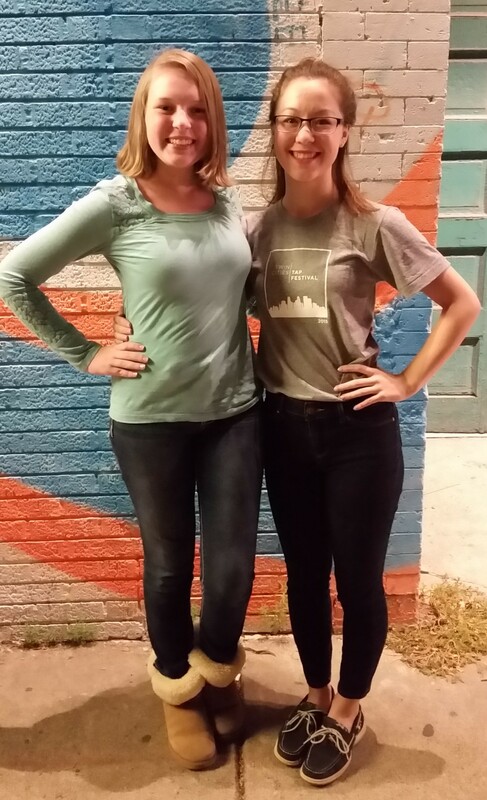 Grace and I attended the first ever Twin Cities Tap Festival last weekend. What a cool experience! The festival had a lot to offer. On Thursday night, there was a Student Showcase. We didn’t go, but after seeing who all the performers were, we would have loved it. Master classes were offered by several different instructors at 3 different levels. 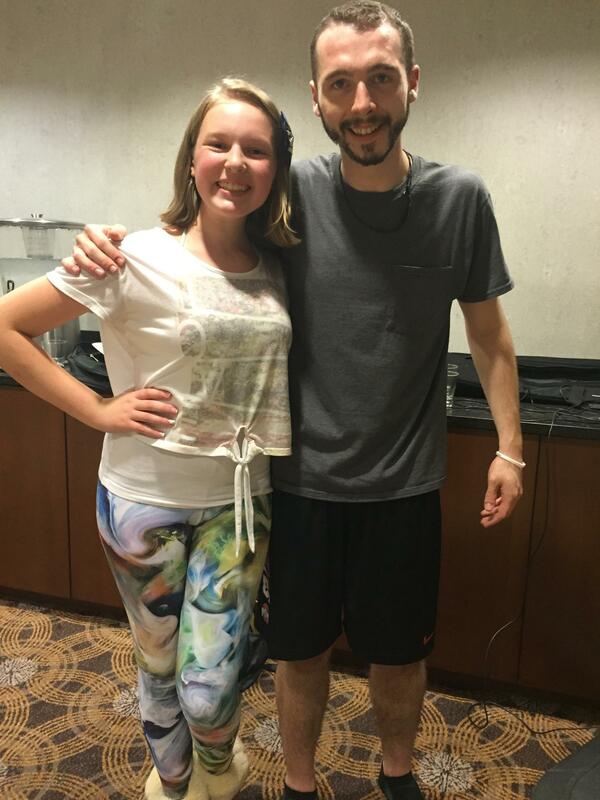 Grace attended one intermediate class, taught by Bruce DeMorrow. We have seen him at competitions, but have never gotten to see him dance, let alone take a class from him. Grace really enjoyed his class! In addition to the dance routine they learned, she especially had fun doing tap improv, something she rarely has an opportunity to do. She said their instructions were to imagine they were having a conversation with another person, using only their feet to communicate. Fun! Grace wanted to take more classes, but at $30/class, plus a $25 registration fee, just after homecoming, I was kind of tapped out (no pun intended). I thought the price of the classes was just about right, though it would have been great if they offered bundle pricing for students wishing to take multiple classes. This year, if you registered before August 1st, you would pay only for the classes. Next year, we will definitely register before the cut off date; that’s one more class she could have taken (or I could have taken one with her). Grace and teammate Paige, who also took class with Bruce DeMorrow. After the Master Class, was the Masters Concert. There were solo and group performances by some amazing tappers from both Minnesota, and around the world. The show started out with Nico Rubio, bringing some humor into his tapping. He had some crazy movements with his legs and feet, and made incredible sounds! We were impressed with all the soloists at how many different sounds they were able to make, with what looked like very little movement of their feet at all! Many of the soloists performed improv, accompanied by live music. There were dances that demonstrated how feet can be used as instruments. The Kaleena Miller Dance group literally played their music with their feet. Like a choir all singing melodies and harmonies, several parts coming together to make beautiful music, so were the four performers with their feet. Each person had their part in the music, sometimes it was the melody, sometimes it was the harmony, but together, they created a song (and dance). The fourth performance of the show was by Elite Tap Feet. This was a group that Grace auditioned for back in May, but did not get selected for. Of the 50 or so who auditioned, only about 15 were chosen. One of them was Grace’s first “big sister” at Lake Area Dance Center, Madelyn Lee. Madelyn is currently one of the studio’s youngest dance teachers and choreographers, and is an all-around wonderful person. We were so proud of her for being part of this group!! What I really enjoyed about the Elite Tap Feet performance was the energy level this group of teens had. They all looked like they were really enjoying themselves on stage. I also appreciated that none of the dancers had on “competition makeup” or fake eyelashes. It was quite refreshing to them looking much more natural than we normally do when we see them at competitions. The last performance of the night, was by Sam Weber. He started out with some improv, then went into another full performance of a self-choreographed piece. He was talented, and beautiful (yes, I said that about a man). He was graceful, and he made every step look simple, even though I know it was extremely difficult. Sam’s performance had to have been at least 4-5 minutes (if not longer). How he kept up his stamina, without looking even a bit winded, is beyond me. I guess that’s why he’s the Master!?! Most of the event took place at the Southern Theater in Minneapolis. It’s a really cool theater, with an “old” appearance. This is the second dance event we have attended at this theater, and we have enjoyed both of them. The classes were mostly held at the Marriott Hotel just around the corner. 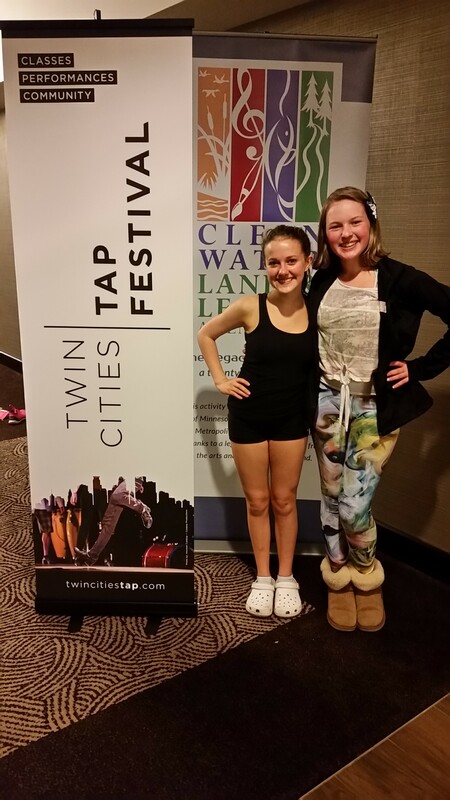 We will definitely attend the Twin Cities Tap Festival again! Next year, we will register further in advance, so we can beat the registration fee. I will likely also take classes. It sounded like way too much fun not to (even if my daughter is embarrassed that her mom is in the class). Grace plans on auditioning again for Elite Tap Feet, especially now that she has one under her belt. We will also attend the Master Concert again, and will likely attend the Student Showcase as well.